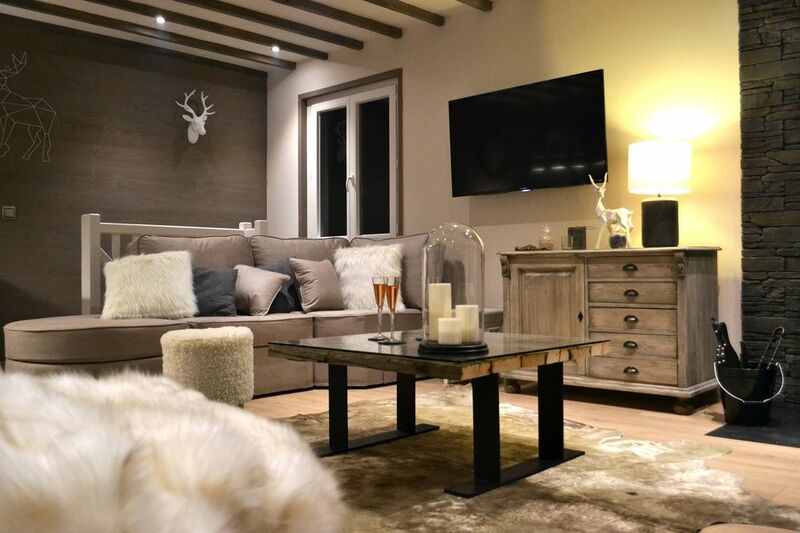 Ideally located 200 meters from the ski area and at the foot of all services, this luxurious chalet can comfortably accommodate up to 8 people. Equipped with the most modern and refined equipment, it offers in particular a master suite with private bathroom and flat screen. After a day of intense skiing or hiking, a moment of relaxation awaits you in the jet hydro massage shower, before sharing moments of happiness by the fireplace, in a universe of the most cozy married to an elegant contemporary design. The cottage has three private pitches for your vehicles. The amount of the rental includes the personalized welcome and the discovery of the cottage, the bathroom linen and bath with shower gel, shampoo, ..., beds made upon arrival, firewood, raw materials requires (salt, pepper, oil, vinegar) tablet dishwasher, cleaning products, capsule espresso and attentions for children. - Deposit (non-cashable check): 800 €: A deposit of 800 will be payable on the day of arrival with a cash check and refundable on the day of departure. - Pets allowed: 10 € per animal and per day - 50 € per week (1 maximum per apartment - 1st and 2nd categories prohibited). You do everything on foot. Very quiet, it enjoys an exceptional location that will simplify your stay to the maximum (ski slopes 300 meters, restaurants, shops and amenities within 5 minutes walk). Equipped with a very complete equipment, it develops on more than 100 m ² spaces finely decorated and optimized to offer you the greatest comfort with a flat screen in all rooms and living room of the chalet. In summer you can enjoy a garden hexagonal table, sunbathing, and a barbecue for your days or evenings. The warm atmosphere of this chalet, will engrave in your memory, moments shared with friends or family. - 1st bedroom / 1 bed 140 and Italian marble shower, marble wasque, suspended toilet. - 1 living room and child room. - The garden surrounded by pretty trees will fill you, you get a barbecue and a hexagonal table for your summer meals and sunbathing. the second bathroom / wc is en suite with ground floor bedroom. A baby sister service is offered. The chalet was very clean with well working appliances. As hikers the location was excellent for the two of us. We could easily take walks from the chalet or drive to run hikes. We would suggest the 800 Euro damage deposit be disclosed in English instead of french on the english speaking site and for it to show up in the booking box. Also, the additional electricity charge should be disclosed in the booking box as well. We were a party of 2 families with 4 adults and 2 children. The chalet was perfect for our needs and was spacious enough to accommodate us all. We loved the main living room with the open kitchen which became the focal point for the week. The kitchen is very well equipped and we had great family meals around the table. The bedrooms are very comfortable and there are 2 bathrooms and 2 toilets, perfect for a party of our size. The children loved the chalet because they could spread out under the trees and relax in their own room if they wanted to. The chalet was lovely, not too hot with highest temperatures outside, and there was always enough hot water. The environment from the chalet is lovely and provides a constant reminder of being in the mountains. We didn’t use our car because shops and restaurants are at the corner. Easy walk also to fitness trails. Thank you for this wonderful stay in your lovely chalet. Everyone said that it was a fantastic week! The best House we have never used ! The house was so beautiful , better like shown in photos ! My friend and I loved the place, it has everything u need (washing machine, dish washer, fireplace, garden... etc). It is very large and confortable. Very goods beds ! The place is perfect, we didn't used our car! The owner is very friendly! Very clean , comfortable, if vacation with family it's very convenient. Nous avons été enchantés par les environs et avons passé un bon séjour dans un joli chalet fonctionnel et décoré avec beaucoup de goût. Les propriétaires sont des personnes disponibles, très agréables et serviables. Laeticia nous a fait un gentil accueil et nous a donné pleins d'informations pour découvrir les environs. Ne manquait que la neige! Merci à vous, nous reviendrons avec plaisir. Très bon séjour dans une belle location ou rien ne manque. Magnifique région sous un beau soleil. Je ne peux que recommander cette location ou le propriétaire et Leatitia sont à notre écoute. Si vous voulez passer un séjour au calme dans une belle région, vous pouvez sans hésiter choisir cette location ou tout est fait pour vous faciliter la vie avec un équipement très complet. Le chalet est très fonctionnel et décoré avec beaucoup de goût. Les trois chambres sont grandes et la literie de très bonne qualité. Il est très bien placé au pied des pistes et pas loin de nombreux départs de randonnées. Nous avons avons passés 10 jours vraiment agréables et nous y reviendrons très prochainement. Nous remercions très chaleureusement les propriétaires qui sont des gens charmants.